Estimates based on the North Korean census suggest that 240,000 to 420,000 people died as a result of the famine and that there were 600,000 to 850,000 unnatural deaths in North Korea from 1993 to 2008. North Korea has not yet regained food self-sufficiency and relies on external food aid from China, Japan, South Korea, Russia and the United States. 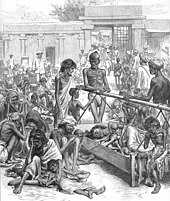 While Woo-Cumings have focused on the FAD side of the famine, Moon argues that FAD shifted the incentive structure of the authoritarian regime to react in a way that forced millions of disenfranchised people to starve to death. Evan Fraser, a geographer at the University of Guelph in Ontario, Canada, explores the ways in which climate change may affect future famines. To do this, he draws on a range of historic cases where relatively small environmental problems triggered famines as a way of creating theoretical links between climate and famine in the future. 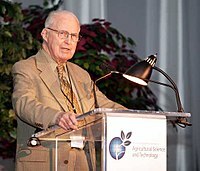 Drawing on situations as diverse as the Great Irish Potato Famine, a series of weather induced famines in Asia during the late 19th century, and famines in Ethiopia during the 1980s, he concludes there are three "lines of defense" that protect a community's food security from environmental change. The first line of defense is the agro-ecosystem on which food is produced: diverse ecosystems with well managed soils high in organic matter tend to be more resilient. The second line of defense is the wealth and skills of individual households: If those households affected by bad weather such as drought have savings or skills they may be able to do all right despite the bad weather. The final line of defense is created by the formal institutions present in a society. Governments, churches, or NGOs must be willing and able to mount effective relief efforts. Pulling this together, Evan Fraser argues that if an ecosystem is resilient enough, it may be able to withstand weather-related shocks. But if these shocks overwhelm the ecosystem's line of defense, it is necessary for the household to adapt using its skills and savings. If a problem is too big for the family or household, then people must rely on the third line of defense, which is whether or not the formal institutions present in a society are able to provide help. Evan Fraser concludes that in almost every situation where an environmental problem triggered a famine you see a failure in each of these three lines of defense. Hence, understanding how climate change may cause famines in the future requires combining both an assessment of local socio-economic and environmental factors along with climate models that predict where bad weather may occur in the future. ^ Reza, A.; Tomczyk, B.; Aguayo, V. M; Zagre, N. M; Goumbi, K.; Blanton, C.; Talley, L. (2 October 2008). "Retrospective determination of whether famine existed in Niger, 2005: two stage cluster survey". BMJ. 337 (oct02 1): a1622. doi:10.1136/bmj.a1622. PMC 2658864. PMID 18832413. Lay summary – ENN. ^ "Live Aid concert". HISTORY.com. 13 July 1985. Retrieved 14 September 2018. ^ "Famine Trends Dataset, Tables and Graphs – World Peace Foundation". sites.tufts.edu. Retrieved 15 October 2017. ^ Manning, Joseph G.; Ludlow, Francis; Stine, Alexander R.; Boos, William R.; Sigl, Michael; Marlon, Jennifer R. (17 October 2017). "Volcanic suppression of Nile summer flooding triggers revolt and constrains interstate conflict in ancient Egypt". Nature Communications. 8 (1): 900. Bibcode:2017NatCo...8..900M. doi:10.1038/s41467-017-00957-y. PMC 5645420. PMID 29042538. Lay summary – ScienceDaily (22 November 2006). ^ Miller, Joseph C. (January 1982). "The Significance of Drought, Disease and Famine in the Agriculturally Marginal Zones of West-Central Africa". Journal of African History. 23 (1): 17–61. doi:10.1017/S0021853700020235. PMID 11632226. ^ "Food and bulletin volume 9, number 1, march 1987". www.unu.edu. Retrieved 28 November 2018. ^ Chang, Gene Hsin; Wen, Guanzhong James (October 1997). "Communal Dining and the Chinese Famine of 1958–1961". Economic Development and Cultural Change. 46 (1): 1–34. doi:10.1086/452319. ^ Smil, V. (18 December 1999). "China's great famine: 40 years later". BMJ. 319 (7225): 1619–1621. doi:10.1136/bmj.319.7225.1619. PMC 1127087. PMID 10600969. ^ Moon, William J. (2009). "The Origins of the Great North Korean Famine: Its Dynamics and Normative Implications". North Korean Review. 5 (1): 105–122. doi:10.3172/NKR.5.1.105. JSTOR 43910265. SSRN 1580198. Chisholm, Hugh, ed. (1911). 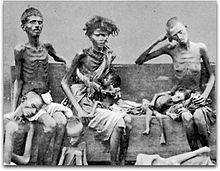 "Famine § Famines in India" . Encyclopædia Britannica. 10 (11th ed.). Cambridge University Press. p. 176. ^ Ellman, Michael (1 September 2000). "The 1947 Soviet famine and the entitlement approach to famines". Cambridge Journal of Economics. 24 (5): 603–30. doi:10.1093/cje/24.5.603. ^ "Inland fishery enhancements". www.fao.org. Retrieved 28 November 2018. ^ Fraser, Evan D.G. (December 2006). "Food system vulnerability: Using past famines to help understand how food systems may adapt to climate change". Ecological Complexity. 3 (4): 328–335. doi:10.1016/j.ecocom.2007.02.006. ^ Simelton, Elisabeth; Fraser, Evan D.G. ; Termansen, Mette; Forster, Piers M.; Dougill, Andrew J. (June 2009). "Typologies of crop-drought vulnerability: an empirical analysis of the socio-economic factors that influence the sensitivity and resilience to drought of three major food crops in China (1961–2001)". Environmental Science & Policy. 12 (4): 438–452. doi:10.1016/j.envsci.2008.11.005. ^ Simelton, Elisabeth; Fraser, Evan D. G.; Termansen, Mette; Benton, Tim G.; Gosling, Simon N.; South, Andrew; Arnell, Nigel W.; Challinor, Andrew J.; Dougill, Andrew J.; Forster, Piers M. (6 March 2012). "The socioeconomics of food crop production and climate change vulnerability: a global scale quantitative analysis of how grain crops are sensitive to drought". Food Security. 4 (2): 163–179. doi:10.1007/s12571-012-0173-4. ^ Fraser, Evan D.G. ; Simelton, Elisabeth; Termansen, Mette; Gosling, Simon N.; South, Andrew (March 2013). "'Vulnerability hotspots': Integrating socio-economic and hydrological models to identify where cereal production may decline in the future due to climate change induced drought". Agricultural and Forest Meteorology. 170: 195–205. Bibcode:2013AgFM..170..195F. doi:10.1016/j.agrformet.2012.04.008. ^ a b de Waal, Alex (January 2018). "The end of famine? 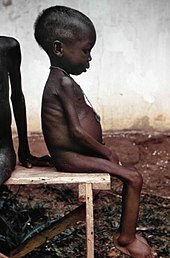 Prospects for the elimination of mass starvation by political action". Political Geography. 62: 184–195. doi:10.1016/j.polgeo.2017.09.004. 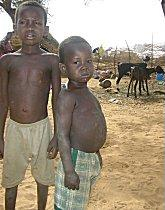 ^ "What Causes a Famine to Break Out?". science.howstuffworks.com. 5 July 2011. Retrieved 21 February 2019. ^ "Alex de Waal | The Fletcher School". fletcher.tufts.edu. Retrieved 24 February 2019. ^ Tauger, Mark B. (1 January 2001). 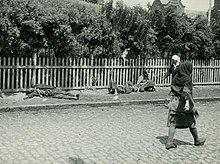 "Natural Disaster and Human Actions in the Soviet Famine of 1931–1933". The Carl Beck Papers in Russian and East European Studies (1506): 67. doi:10.5195/CBP.2001.89. ^ Ghodsee, Kristen R. (2014). "A Tale of 'Two Totalitarianisms': The Crisis of Capitalism and the Historical Memory of Communism" (PDF). History of the Present. 4 (2): 115–42. doi:10.5406/historypresent.4.2.0115. JSTOR 10.5406/historypresent.4.2.0115. ^ "Half the population of Yemen at risk of famine: UN emergency relief chief". UN News. 23 October 2018. Retrieved 26 October 2018. ^ "Famines". Our World in Data. Retrieved 8 December 2017. ^ "Begley: Let Them Eat Micronutrients". Newsweek.com. 20 September 2008. Retrieved 1 February 2016. Woo-Cumings, Meredith, "The Political Ecology of Famine: The North Korean Catastrophe and Its Lessons" (PDF). 22 January 2015. (807 KB), ADB Institute Research Paper 31, January 2002.